How do you research your mysteries? Do you visit firing ranges, attend citizens’ police academies, read blogs by policemen and doctors, attend conferences, read books on crimes and crime solving? I’ve done all that, but none of it did me any good for my most recently published project. 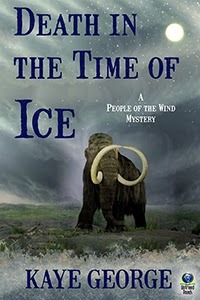 When I decided to write a mystery featuring Neanderthals, I knew I would have to do very different research. I didn’t realize how much--or how fun it would be! I like reading well-written textbooks, so that wasn’t drudgery. The reports on the new sequencing of the Neanderthal genome held me spell bound. Maybe that wouldn’t thrill you. But who wouldn’t like visiting a Mammoth Museum? The Waco Mammoth Museum helps visitors step back in time thousands of years and visit the huge animals who once lived there. This is the stream bed where a herd of mammoths was discovered in 1978 by Paul Barron and Eddie Bufkin, two men out hunting arrowheads. The bone they brought to Baylor University was declared to be that of a Columbian mammoth. To give you an idea of their size, this mural is life sized and I’m about 5’ 8” tall. A herd of 19 mammoth, mothers and babies, died here 68,000 years ago. They may have gotten trapped in a steep sided channel and drowned when a flood arose. Here are the fossils of one of the mammoths. These are relatives of the animals that the Neanderthals in my novel, Death in the Time of Ice, hunted. The Columbian mammoth didn’t range as far north as the edge of the approaching glacier 30,000 years ago. The wooly mammoth would have been what they hunted, had they been on this continent. Well, they were on the continent in my book anyway, so they did hunt them. New discoveries are made all the time - here's one of the latest. Kokat No Ear is not here, Enga Dancing Flower thought-spoke. Tog Flint Shaper read her thought and her fear. He summoned several others. Help me search the tall grasses. Then Tog spied a smear of dark liquid in the grass, leading toward the trees. He must be in the forest, thought-spoke Tog. He ran into the woods, black with nightfall now, following the even blacker trail of Red and summoning the other three males to come with him. The females squatted next to each other and waited. The males sent no thoughts to them. Enga checked on Ung. She was sound asleep. The wound still bled, but now seeped instead of spurting. Enga felt her shoulders relax just a notch. People of the Wind Neanderthal series. promotion. Kaye lives in Knoxville, TN. 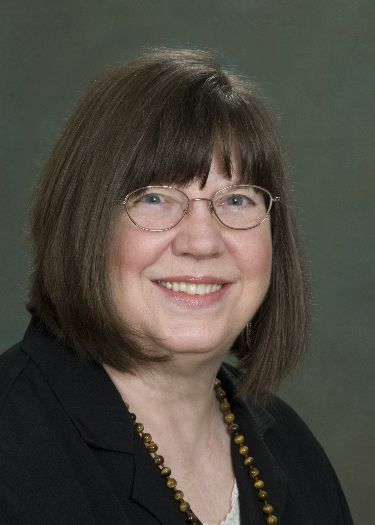 Learn more about Kaye at her webpage and her blog, and find her books at Untreed Reads. Leave a comment and you might win this snazzy mug! (Be sure to check back or Kaye won't be able to send it to you if you win.) Winner will be chosen at random from among people who comment. Thanks for hosting me here today, Sheila! What amazing research you've had to do. Sounds like an interesting read. Now that kind of research is fun! I think they have a lot of stuff in the Texas Memorial Museum on the UT campus, too. Marilyn, since we knew we were moving and would probably never get back there, we took lots of pictures. Sheri, I love the research for this project. Since I'm planning on doing more of these, I try to keep up with the almost constant new findings about Neanderthals. Interesting subject, Kaye. Its amazing to me the research that goes into a book and how much authors do of it. No wonder your the writer and I'm the reader! Thank you for the chance to win a mug. As I mentioned, I love doing research on these topics! I'm glad you stopped by, Terry. I never got to that one! But since we still have family in Austin, it's possible I can make it in the future. Thanks for the tip! This was a fun post! What a great place to do research. It must have been very immersive and great fuel for your imagination to be there. If we still lived near Waco, I'd be doing volunteer work there. Loved the place! Two things right off - my son loves mammoths and would adore that mug! Second I love mysteries, or any book, that is well researched, and you sound like a writer/researcher after my own heart! Very cool about the discovery centre - makes me wish I was closer to it. Thanks again Sheila for having such interesting guests! I do love my book cover! I thought it deserved a mug. Thank YOU for stopping by. There's a fine line between enough research and too much, isn't there? And then you have to decide how much to use. I've just generated a winner with http://www.random.org/! Anonymous, you're the winner. Please let me know your name and shipping address and I'll send you a mug. You can email to kayegeorge@gmail.com if you wish. Congratulations! I used random.org to generate a mug winner. Anonymous, please reveal yourself! 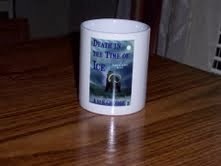 You can send your mailing address to me at kayegeorge@gmail.com and I'll send you the mug. Thanks!